This Sour Cream Coffee Cake is not only incredibly EASY to make, it’s absolutely delicious! 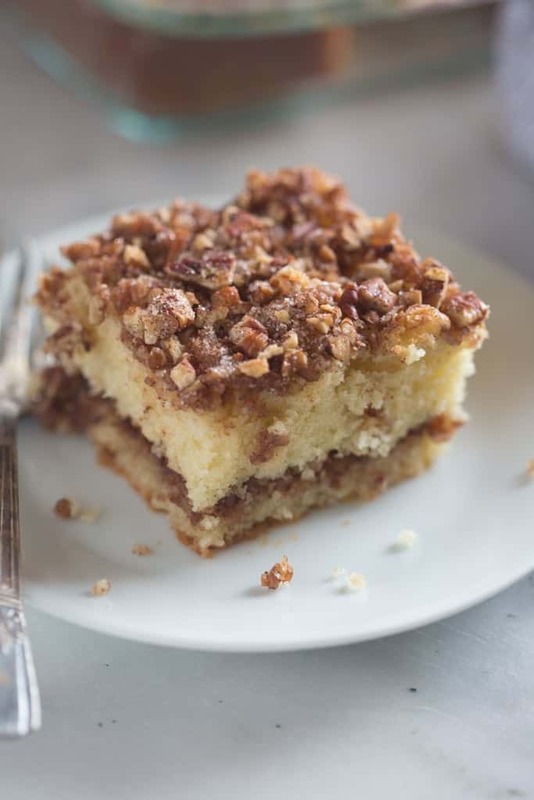 A tender crumb cake with cinnamon pecan topping. You wont be able to stop at just one piece. Happy weekend, friends! It’s date night for me and my husband–we’re determined to make every weekend date-night before our new baby comes in six weeks! I have a feeling there will be many date-night’s IN after the baby. Tonight we’re headed to see the new Star Wars movie at the dine-in theatre by our house. Have you ever been to a dine-in theatre? This one has set the bar high for my movie-going expectations. What’s not to love about huge comfy reclining chairs and a great menu of food to choose from while you watch a movie? They serve these yummy Chipotle Chicken Wraps that I love so much I created my own! And the best news of all is that tomorrow is SATURDAY! Time to get some extra sleep in the morning and possibly make a delicious breakfast for my family, like this yummy and easy coffee cake! Why do they call it coffee cake? 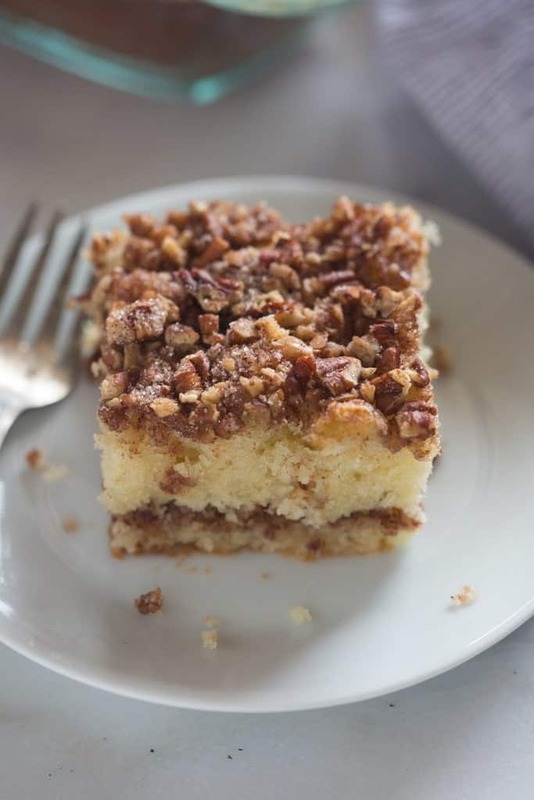 Coffee cake is a term given to foods that are intended to be eaten with coffee, or other brunch type foods. Imagine little cakes you would serve at a tea party or having coffee with a group of friends. There is generally not coffee in the actual cake but it is usually a sweet cake with light streusel or icing. I love this sour cream coffee cake recipe for a few reasons. First, an most obviously, it’s killer delicious. 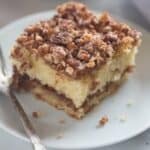 The cake part is perfectly soft and tender and the topping is layered both inside the cake and on top, adding the best cinnamon sweetness throughout, and the perfect crunch on top. I also love this recipe because it can pass as breakfast, brunch, or even dessert. And, most of all, I love that I usually have everything on hand that I need to make this recipe! Yay for an easy brunch idea that requires hardly any work! I can promise this cake will make everyone in your house happy! 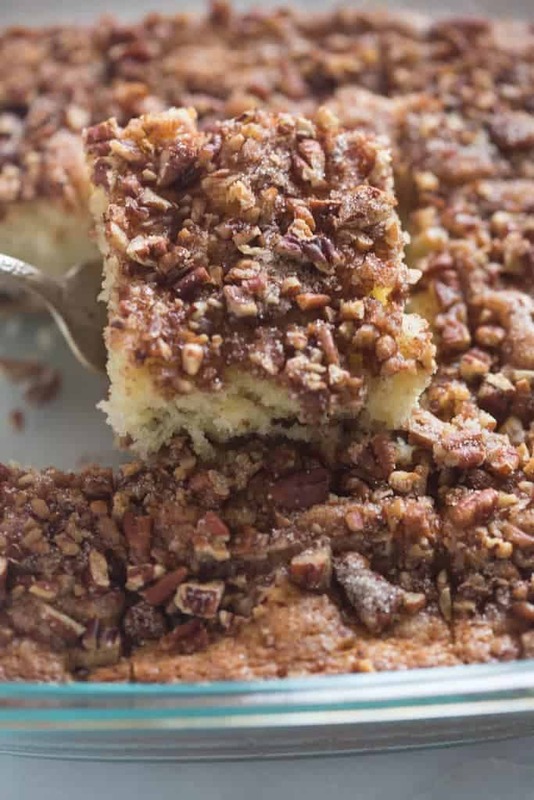 This Sour Cream Coffee Cake is a tender crumb cake with cinnamon pecan topping. Combine topping ingredients together in a bowl. Set aside. In a mixing bowl cream together butter and sugar until pale and fluffy. Add egg and mix. Add sour cream and vanilla and mix. In a separate bowl whisk together the flour, baking soda and baking powder. Add dry ingredients to butter mixture and mix just until combined. Spoon half of the batter into your prepared pan and smooth into an even bottom layer. Sprinkle half of the topping mixture over the top. Spoon remaining batter on top and smooth into an even layer. Sprinkle remaining topping mixture over the top. Bake in preheated oven for 40-45 minutes or until a toothpick inserted into the center comes out clean, or with few crumbs. Check the mixture about half way through baking --you may want to put a piece of tinfoil over the top to keep the top from browning too much. *Double the recipe for a 9x13'' pan and you may need to cook it for about 5 extra minutes. Super moist and delicious! My new favorite recipe. I added chopped dark chocolate to the crumb topping which took it to the next level of yummy! 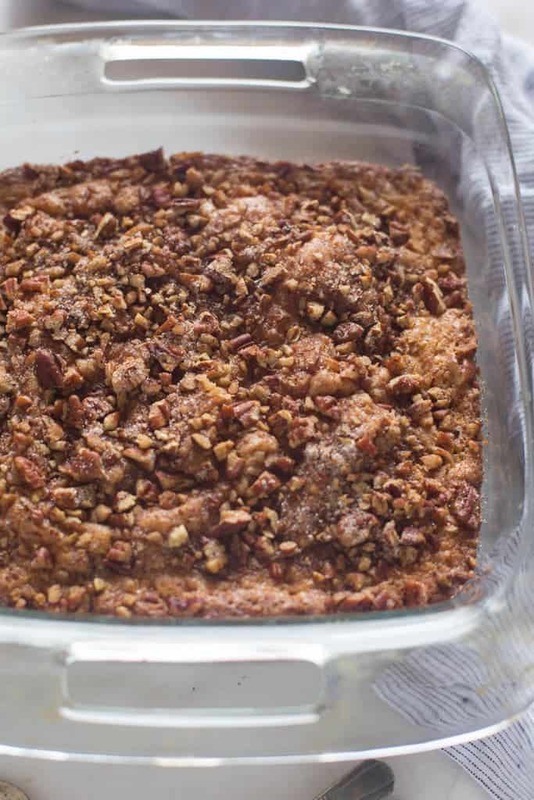 Can this batter be made the night before and then bake the coffee cake in the morning? Hi Cindy, I wouldn’t recommend that (because of the baking powder and soda in it that are activated when the wet and dry ingredients are mixed) sorry! Do you think I can freeze it and then thaw over night and pop it back in oven to warm. Or how would you recommend reheating? Hi Pam, use I would suggest freezing it, thawing it overnight in the fridge and then reheat it briefly in the oven (don’t want it to dry out), or each slice for a few seconds in the microwave. Enjoy! How about adding cinnamon chips? Can you bake it in a bunny pan? then the other batter mix on top. Then bake. Overall very good. Batter was excellent. Only issue I had was that the topping was kind of dry with just nuts and sugar. I think one comment suggested adding a little melted butter over the top which would improve the end result. I substituted plain yogurt for sour cream and found 25 minutes baking time long enough. Yummy!